The Adventure Park at Sandy Spring reopens for the season on Friday! 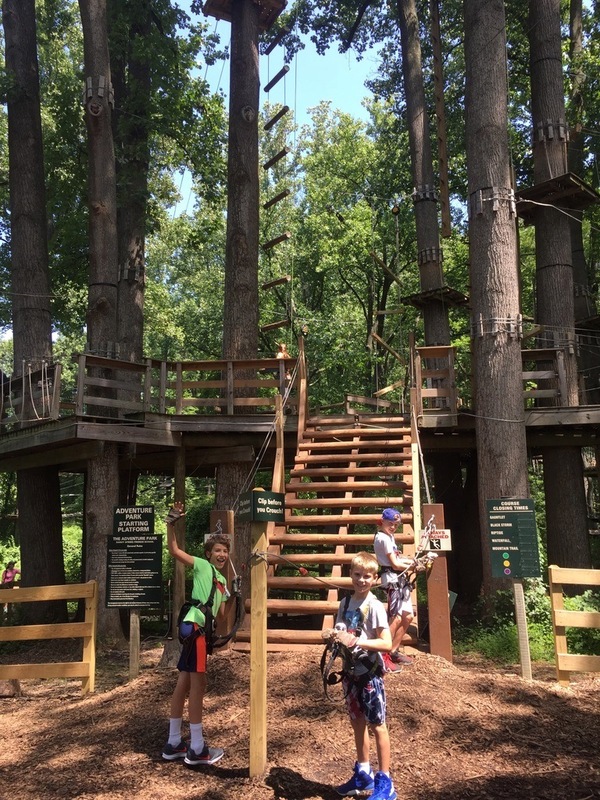 Kids as young 5 can experience thrills on the ropes courses and ziplines in the park’s aerial adventure forest, the largest in North America. Children ages 5-6 and an accompanying adult have access to two of the easier courses. Older kids can do much more. It may seem like a pricey venture, but it’s so worth it. Trust me. Read more about the park in this KFDC post. For one night only, the Air & Space Museum is opening their doors exclusively to DCPS K-8th students and their families for an unforgettable evening of fun including a virtual journey through our solar system in the Albert Einstein Planetarium; Discovery Stations about spacesuits, meteorites, and more; hands-on activities, food, and prizes, and a free gift at the end of the evening for the first 100 people to register. All students must be accompanied by an adult. Register in advance here. A suit of of armor, woodcarvings of animals & magical beasts, towering ceilings… for children, the Heurich mansion is a magical castle to explore. Kids in the Castle is a rare occasion to explore it all, as the museum typically is not open to children under 10, but during this special event, they are the main focus. Heurich encourages kids and families to wander through the house at their own pace, complete photo scavenger hunts to win prizes, and take a more detailed self-guided tour if they desire. If weather permits, you can also relax and play games in the Castle Garden. Be sure to register for free tickets — only a limited number will be available at the door. Kids (and adults!) who like fossils, rocks, and/or gems are in for a treat. The 54th Annual Show of the Gem, Lapidary, and Mineral Society of Montgomery County, MD will have all that and then some. There will be dealers selling collectibles, demonstrations, exhibits, door prizes, free workshops, free specimens for kids, mini mines, and more. Get travel inspiration, experience culture, and have fun! A big expo like this might sound like a grown-up affair, but a bunch of cool pursuits will thrill the kids, too. Besides the hundreds of travel providers and destinations featured, there will be cultural performances, Segway rides, virtual reality experiences, and more family fun. Oh, you might get to meet Andrew McCarthy (yes, from the Brat Pack), too! The city’s 19th Annual St. Patrick’s Day Parade will include both traditional Irish performances and classic parade pageantry. Celtic dancers, bagpipes, marching bands, clowns, firetrucks, and more will make their way through town. It’s a pet lover’s dream weekend! Enjoy exciting entertainment, shop pet products from over 150 local and national vendors, speak with pet adoption reps and learn about the process, talk to animal experts, bring your own pet to play (leashed animals welcome! ), and more. Ring in the Persian New Year at the annual Nowruz celebration! Free attractions and activities for all ages include storytelling, hands-on art projects, live music, film screenings, calligraphy, food, and the featured exhibitions Engaging the Senses, Feast Your Eyes, and Shaping Clay in Ancient Iran. Celebrate the centennial of the 19th Amendment! Contemplate the issues that were debated, the struggle that ensued, and some of the people who played a part making women’s voting rights possible through hands-on activities for all ages. The Big Apple Circus is still in town and celebrating its 41st season, featuring amazing stunts under the big top. Known for its one-ring, artistic, European-style, no seat is more than 50 feet from the performers. That’s perfect for viewing some first-ever feats for the Circus along with fan favorites. Hire wire acts, contortionists, bicycle acrobatics, hilarious clowns, and doggie dances are some of thrills and fun you can expect. Read a review of one of our past experiences at a Big Apple Circus show. * Reserve free tickets to Shakespeare for the Young: Midsummer Magic, this week’s Saturday Morning at the National performance. * Anne of Green Gables brings a classic to Hylton Performing Arts Center. * Little ones will love Art on the Horizon’s Beep Beep. * Anatole: Mouse Magnifique is at the Bethesda theatre, too. * Watch Rapunzel let down her hair at The Puppet Co.
* And World on a String is the featured Tiny Tots performance there on Sunday. Films from across the globe are being screened around the DC-Metro area for the the 27th annual Environmental Film Festival. And there are a few flicks among them that kids will likely enjoy. Science Fair, Into the Canyon, Sharkwater, Journey of the Whopping Crane, and The Dawn Wall are a few of them (and I should note that they probably aren’t for the young children). There are even more films to consider for a grown-up outing. View the website for more details and to view trailers. Celebrate St. Patrick’s Day with District Irish Dance as they offer a special FREE community Irish dance class! You’ll jump, hop, step and sweat in Celtic Fit, their popular Irish dance-inspired fitness + social ceili (pronounced “kay-lee”) class! Get your heart rate up AND warm your soul with the spirit of Irish music, dance and culture! All ages and levels welcome. Pre-register here. Hop on the Magic School Bus for a ride in this new musical adaptation based on the original book series published by Scholastic. When the class gets lost on the way to the planetarium, Ms. Frizzle saves the day by blasting into outer space for an epic interplanetary field trip! But when rivalries both old and new threaten to tear the students apart, our young heroes must learn to pull together or risk getting forever lost in the solar system. Stop by the Historic Vienna Train Station where you can see and hear HO scale model trolleys and trains, including Thomas and some of his friends on display and in operation. It’s a great family fun and activity for the young and young at heart. The Station is at 231 Dominion Road NE, Vienna, VA along the W&OD trail just past the Caboose. Kick it at a DC United match on Saturday evening as they host Real Salt Lake. It’s recommended to go early — to get to your seats in time for kick off, plus there are usually pre-game pop-ups and activities on the plaza. Join Ari and her son for a family yoga class for ages 4 and up. The class will be 45 minutes and include all levels vinyasa poses, opportunities for partner yoga and a relaxing savasana meditation at the end. Please arrive at least 15 minutes before class begins. The room will not be heated. All children must attend with at least one parent or guardian. Register to save your spot at YogiAri.com (the class will be capped at 28 attendees), and if you have any questions in advance of the class, feel free to email Ari at [email protected] or text her at 717.903.7878. In honor of St. Patrick’s Day, the ice rinks are hosting Shamrock Skate! Wear something green or Irish and skate for just $8 — includes admission and skates. The Public Skating Session at Cabin John Ice Rink is 12:30-2:30pm and at Wheaton Ice Arena 11am – 1p. When was the last time you dressed up like a queen or king? Now is your chance – the EDCJCC’s Purim Carnival is the perfect time for children and adults to dress up and celebrate this festive annual holiday! Join for carnival games, arts & crafts, hamantaschen (yummy Purim treats), songs and a community service project! Don’t forget your costume! All ages are welcome at this Carnival, but it’s geared towards ages 3-6. Join the Agudas Achim Congregation to celebrate Purim on Sunday. The carnival will feature games, prizes, face painting, arts and crafts, a moon bounce and more! Popcorn, cotton candy, and lunch are available for purchase. Tickets: All you can play and bounce for $25 or $1, each. The first hour (10:30-11:30am) is open to children ages 0-5 only. Starting at 11:30am, the carnival is open to all children. Get messy like a street artist at a Kidz Graffiti Party. Children of all ages are invited to paint their very own master pieces on the ArtJamz walls.The lounge will be open for accompanying parents, and they’ll be playing jamming tunes to inspire all the little artists. Afterwards, your family can purchase additional studio time and canvas and let your vision come to life off the wall. Celebrate St. Patrick’s Day with social Irish dances for all ages along with performances by Shannon Dunne Dance. Live traditional music will be performed by Sean McCominskey and Friends. Enjoy a casual happy hour for parents and tots! The Bright Siders will hit the stage with engaging songs to entertain adults and get children moving as they present music that helps kids and families have meaningful conversations about emotions. Created by award-winning songwriter Kristin Andreassen and Brooklyn child psychiatrist Dr. Kari Groff, the Bright Siders feature excellent musicianship and skillful audience engagement. And your first beer or glass of wine is on the house! * Love You Hard: A Memoir of Marriage, Brain Injury, and Reinventing Love, by local mom Abby Maslin, was released this week and is getting rave reviews. I’m only chapter five, and already it’s an absorbing and breathtaking read. * The National Building Museum is hosting Teen Night for kids in grades 9-12 on March 23. * Marvel Universe LIVE! is coming to town in the next couple of weeks, and there are discount tickets available. * It’s almost cherry blossom season, and there’s a new round-up of the best events for families to celebrate it. * And the annual Tips for Families Viewing the Cherry Blossoms will come in handy as you plan to see the famous flowers. * Who else is excited about the new (but final 🙁) season of Catastrophe? Monday – Get out for some active fun amid the lovely woodsy setting of Cabin John Regional Park. Kids can climb, swing, jump, slide, and run on the sprawling playground. The Miniature Train isn’t open right now, but the playground alone has plenty to keep children happy. Bring along food for a picnic — several tables are right there for lunch al fresco. Admission is free. Tuesday – Savor the sunshine and some outdoor time at Roosevelt Island, where you can hike and get a dose of history in one fell swoop. The trails are easy for little legs to tramp, and you can explore the Memorial Plaza to learn about the legacy of President Theodore Roosevelt. The entrance to the park is located right off the GW Parkway, just past the Roosevelt Bridge, and accessible only from the northbound lanes. Hours are 6am – 10pm, and admission is free. Get a little more of the KFDC take on it in this post about local walks in the woods with kids. Wednesday – Learn about the area’s wildlife, enjoy hands-on activities in the Nature Center, take a hike, and visit horses at Rock Creek Park. The Nature Center is open Wednesday – Sunday, 9am – 5pm, and admission is free. There are nearby trails for walks in the woods. You can also visit the equine residents at the nearby Horse Center — guests are welcome to stop by the stables, though pony rides are not offered this time of year. Thursday – Join a Tunes for Tots Music Class at Kinder Haus Toys in Arlington, where they teach actual music concepts to children in a fun and interactive way through a variety of age-appropriate aural, visual, and physical activities. Sessions are at 10:05am and 11am. Admission is $16/child — call 703.527.5929 to sign up. Recommended for ages 6 months – 3 years. Friday – Rock out with The Not-Its at Discovery Theater. The Seattle band will play their music that empowers kids to be innovators, protect the environment and wildlife, and be proud of who they are as part of the Tot Rock series. Showtimes are 10:15am and 11:30am (on Thursday, too). Admission is $3-8. Free Cotton Candy + BOGO Tickets at the Big Apple Circus Next Week! This post is sponsored by Big Apple Circus, however, I only promote events, programs, and places that I genuinely believe in and think would appeal to KFDC readers. This is the last weekend to hit the ice al fresco at most local outdoor ice skating rinks, as many are getting ready to shut down their Zambonis for the season. See this post listing them all for details on where you can glide ‘neathe the sky one last time this winter. Politics & Prose is hosting Fabien Cousteau, grandson of famed sea explorer Jacques Cousteau, at the Takoma Park Public Library on Friday evening to celebrate his debut graphic novel, Great White Shark Adventure, in his Fabien Cousteau Expeditions series. He will be a speaking and signing books, too! Newseum visitors are invited to enjoy a weekend sharing their pride with family and friends, and to kick off the newest exhibit: Through powerful artifacts, images, and historic print publications, “Rise Up” explores key moments of gay rights history and how activists have used their First Amendment freedoms to demand an end to discrimination against LGBTQ Americans. Even more, take advantage of a special offer that includes two free kids tickets (18 & under) with the purchase of one general admission adult ticket. Join the Museum to celebrate Women’s History Month with a day of hands-on activities, Rosie the Riveter photo opportunities, and special guests who will inspire the next generation of women to break down barriers. This family day will look back at groundbreaking women of the past and forward to what can and will be achieved by women in the future. * Journey Down Huckleberry Finn’s Big River at Adventure Theatre! The Big Apple Circus is in town and celebrating its 41st season, featuring amazing stunts under the big top. Known for its one-ring, artistic, European-style, no seat is more than 50 feet from the performers. That’s perfect for viewing some first-ever feats for the Circus along with fan favorites. Hire wire acts, contortionists, bicycle acrobatics, hilarious clowns, and doggie dances are some of thrills and fun you can expect. Read a review of one of our past experiences at a Big Apple Circus show. Several local bookstores around the area host free story times for children on weekends that often include more than just a reading. East City Bookshop has one for ages 4-8 on Saturday at 10:15am. Head to Hooray for Books in Old Town Alexandria on Friday or Saturday for story time from 10:30-11am. Solid State Books hosts readings on Saturday and Sunday at 10:30am. At Kramer Books, they’ll watch your kiddos while you grab a coffee on Sundays at 11am. March is Music in our Schools Month, and InterAct Theater can’t think of a better way to celebrate than with talented and fascinating guest artists coming to Wheaton Family Theatre Series! Christylez Bacon & Wytold will be bringing the entertainment with Classical Hip-Hop Remixing the Classics. Christylez Bacon is a Grammy nominated beat-boxer and multi-instrumentalist. Wytold is a wildly original electric cellist, composer, and classical musician. Together, they blend hip-hop, go-go, and classical music into amazing and creative remixes of well known songs. They draw from traditional elements of hip-hop–like beatboxing, rhyming and storytelling–with classical music by Bach, Vivaldi and Pachelbel to create something completely fresh and new! Join in this unique experience! Best for ages 3+. Spring is coming, and with it great cycling weather, so now is a good time to make sure you have a ride that meets your needs. Just in time, Phoenix Bikes, a non-profit youth program and community bike shop in Arlington, VA, will be selling a large inventory of quality, refurbished bikes and new bike gear along with Gearin’ Up Bicycles and Bikes for the World. Check out the sale for a great deal on a bike that also benefits local non-profits and be ready to ride this spring! Big Bear Cafe is located at 1700 1st St NW. They’re bringing the luck of the Irish to the waterfront at the Ireland on The Wharf festival! Celebrate the beauty and tradition of the Emerald Isle with bagpipers, a beer garden, Irish dancers, live music, and plenty of family-friendly activities. Slainte! Spend an afternoon with your children or grandchildren, niece or nephew and immerse yourselves in the arts of opera! The opera at the center of the workshop will be Stradella’s La Susanna, which is based on the Bible’s iconic story of Susanna and the Elders from the Book of Daniel. Though the opera story is for mature audiences, the workshop will focus on the power of girls, baroque music – voice and instruments, and the production aspects of opera. Opera Lafayette will connect children to this multi-disciplinary art form using types of learning: Hear live music, see and feel costumes, tell stories, or play with props typical of the 1600s. Enjoy a free afternoon of artistic playtime and immerse yourselves in the art of all arts — opera! Recommended for families with children 8–12 years of age, but all are welcome. PJ Library, The Jewish Federation and the Milton Gottesman Jewish Day School are teaming up to Do Good to help homeless teen mothers. Join them to celebrate Purim with an interactive learning project. Fulfill the Purim mitzvah (good deed) of Matanot La’evyonim (gifts to the poor) by preparing oatmeal kits. They will be shared with the children at the Covenant House Youth Shelter Daycare, a program for single mothers that offers a free on-site day care so that they can complete their education and hold a job. Pre-registration required. Best for ages 3-7. Join the 40 finalists of the Regeneron Science Talent Search, the nation’s most prestigious pre-college science competition, as they display and present their research at the National Geographic Society. Finalists will discuss their projects with visitors who share an enthusiasm for science research.Society for Science & the Public and Regeneron are proud to support these students and hope the exhibition and interaction with them will inspire students, teachers, parents, scientists, and others. Admission is free. Join the crazy fun of Alice in Wonderland’s Mad Hatter and his friends at the strangest of tea parties! At this nature-inspired focused tea time, parents and children will sip tea, enjoy butterfly-shaped sandwiches, and meet a live creature from the story. Join the Family Dance session that takes place the second Sunday of each month. It’s a great opportunity to experience the joy of dance with your children and the community. No experience is necessary, just show up and dance — a family dance leader will show you everything you need to know right then and there, with a focus on having fun! Recommended for families with kids ages 4-12, but all ages welcome! Over 100 years ago, Austrian composer Arnold Schoenberg produced a wildly creative work for a small mixed instrumental ensemble and vocalist called “Pierrot lunaire” (translated: Moonstruck Pierrot). The piece became one of Schoenberg’s most frequently performed works and the instrumentation became a standard setting for future composers to explore texture, tonality, and musical drama. This weekend, the Pershing’s Own Chamber Players, of the U.S. Army Band, present a 21st-century take on this unique instrumentation with music by living American composers. After snow on Friday, temps will go up on Saturday and are forecast to be in the 60’s by Sunday. That’s reason enough to plan an outdoor adventure, even if it’s cloudy. 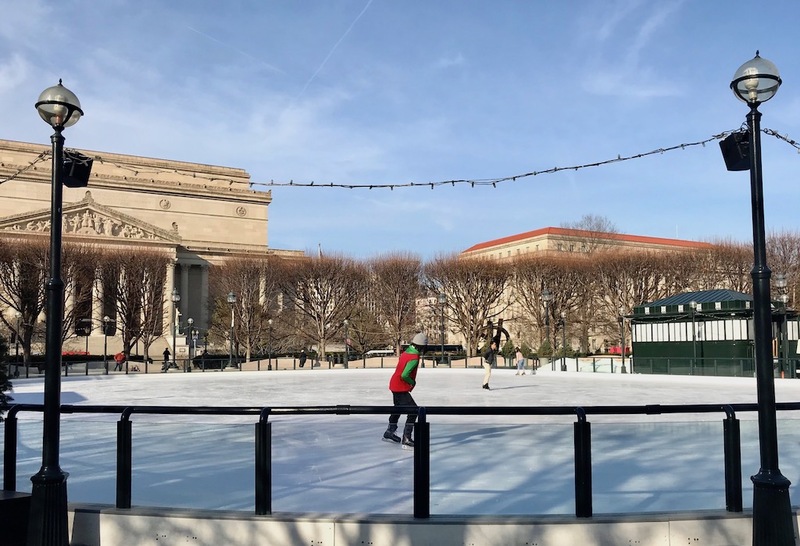 If you need some ideas, consult the round-up of the Best Places in the DC Area to Enjoy a Beautiful Day Outdoors with the Kids. * The Rock ‘N’ Roll Marathon is going to cause a lot of road closures on Saturday. * The National Children’s Museum is returning to DC and scheduled to open at the Ronad Reagan Building in November! * The predicted peak date of the cherry blossoms have been announced. Get ready for DC to turn pink April 3-6! * Heurich House is hosting the next Kids in the Castle on March 16. The free event always fills up quickly, so go register. * To help Sasha keep her allowance, birthday money, and gift cards organized, I just bought this for her, and she loooves it. * This article about local women entrepreneurs shouting out their favorite women-owned businesses is so great. Btw, Happy International Women’s Day!